6 Best-Selling Flavors: Chunky Chocolate Chip, Peanut Butter, Oatmeal Raisin, Sugar, Snickerdoodle and White Chocolate Macadamia. 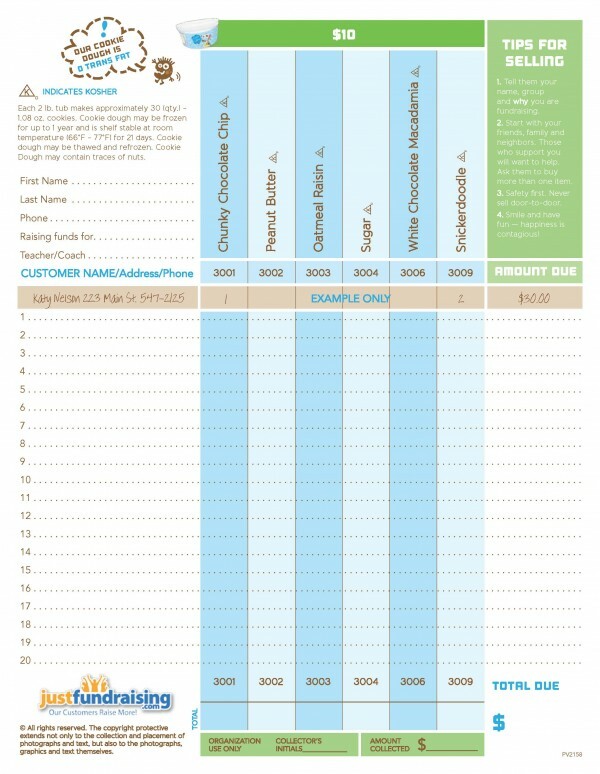 Fundraising sales will be so easy with our $10 format, featuring a 2 lb tubs. We listened to our customers as many expressed an interest in a cookie dough fundraising program that would be made more affordable to their supporters. We took 6 of our best-selling flavors and packaged them into a smaller 2 lb tub, and priced them at an affordable $10 each. They've turned out to be perfect for budget-conscious supporters, and our fundraising customers have found that many people will order 2 for $20. How Does the $10 Crazy About Cookie Dough Fundraiser Work? 1. 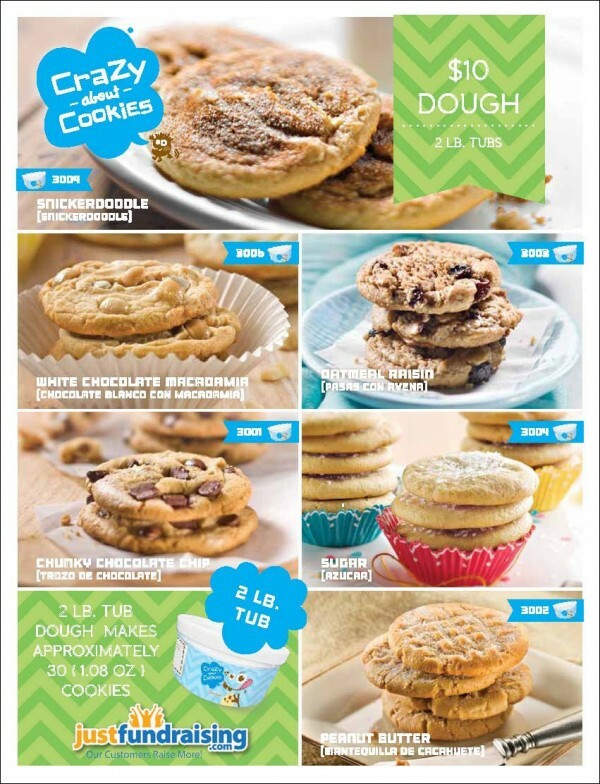 Order 1 $10 Crazy About Cookie Dough order-taker PER fundraising participant – they’re FREE of charge! Our cheer team raised over $1,400 profit for new uniforms! We raised over $2000 for our new school, so that we can start new clubs, help sports and teachers with supplies. This was our first time doing such a fundraiser and it went pretty smoothly. We literally handed out the cookie dough brochures to our students and 2 weeks later we have a profit of $6,300! We recently had our school renovated and remodeled. These new funds raised will help us purchase a new marquee or school sign that will help us communicate key school events to parents and students. We easily raised $7,883 with only 50% participation with our Charter School. I motivated our students by having a Pizza Party for the best selling class, and gift cards for individual best sellers. We're using the money for field trips and other school activities. Our youth basketball team will be able to participate in more tournaments and afford to hold more fundraising events due to the money earned through JustFundraising.com! I have done a few fundraiser with JustFundraising.com - one was the $1 candy bar that did well. The other was the $10 Cookie Dough, the only thing I did not like is that I could not do my order online. I had to fax it. The fundraiser went really well, we ended up raising a lot more than expected, more than we did last year. We raised money for field trips and other traveling expenses. The cookie dough is great, we like that it does not need to be refrigerated immediately which makes it easy to store. The brochures are very visually attractive and the $10 price makes it very easy to sell. We Raised $6,300.00, The South Boston Cheerleaders used some of the funds to travel to Disney for the nationals.Thanks Justfundraising! Mr. Dan made the work and transactions easy. I liked working with him and the company and the products were fine. We use our money to buy praise dancing dresses and the whole uniform that we so needed. Thanks to Just Fundraising we look more like a team and we are having fun dancing in the Lord. We are a small group of 15 students and have a goal to raise $500 with the help of JustFundraising.com!!! We sold 132 tubs and raised $1320.00. The delivery was quick and on time, they even gave me a call beforehand to make sure I would be there to receive it. We were able to raise money for a class trip and plan to do the same fundraiser next year. Very friendly reps. Quick to get back to you to answer questions. sorted and picked up with in a half an hour! We started this fundraiser with our baseball team to help pay for new uniforms and it went very well. We were able to raise more than enough money with our profit and the low price of $10 per tub made it a really easy sell! The Cookie Dough itself is delicious and we are looking forward to using it again next year. Our Cub Scout pack did very well. We were raising money with $10 cookie dough fundraiser to go see the Monster Jam. We were able to do that and pay for all parking.